British firm wants to “bolster” its EV team before integrating electric technology into the 3 Wheeler. 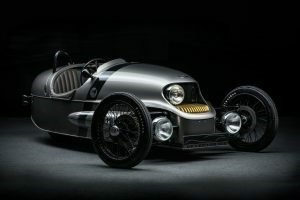 Development of the all-electric Morgan EV3 has been halted due to contractual disagreements with powertrain supplier, Frazer Nash. Morgan said that although it “remains committed to an electric future,” it has shelved the EV3 project until it gains “more EV know-how inside [its] Malvern headquarters”, suggesting more of the development could be brought in-house. You’ll remember that the British firm’s first electric model was previewed in a concept back in 2015 before being evolved to prototype level the following year, along with a promise that a run of 19 cars would be produced in late 2018. But the company had expected Frazer Nash’s supply of hardware to be simply integrated and quickly turned moved to “turn key” level. Managing director Steve Morris told Autocar that “our current EV powertrain supplier is no longer able to fulfil the project within the terms of the contract”, but no further explanation has been provided for the decision. Meanwhile Frazer-Nash Energy Systems’ managing director, Noamaan Siddiqui, agreed that the deal had failed “for a number of contractual reasons”, but said that prototypes his company had built were “very promising”. Part of the firm was recently liquidated, but, according to Companies House, it continues to operate with several new projects. Mark, I just wanted to share the “fix” for the intermittent “no idle with the weber on my CVH Ford powered 4/4. Talked to the man at weber, he said to snip off the end of the plunger on the solenoid sticking out of the left side of the carb. I did this and the idleing problem went away. Just in case you run across it again.